So here’s the deal, six years ago we went around (what is now called) PAX Prime and asked a bunch of folks a few simple questions: what is your favorite co-op game, who would be the best co-op partner, and couch co-op or online co-op. We got some great responses from devs, attendees, and pretty much anybody that was ok with us sticking a camera and microphone in their face. What is your favorite co-op game? Do you prefer couch co-op or online co-op? Who is your co-op partner? If you could play co-op with anyone, from anytime or anywhere, who would it be and what game? We don’t care how you record it - if you want to use a webcam, cell phone, or that old handheld camera your parents left lying around - but commit your answers to some digital media and upload your submission here. Don’t forget to tell us who you are and where you’re from! We recommend using your email address for the file name to ease in contact. You can email us the video at tips@co-optimus.com, send it to us via our Facebook Page at https://www.facebook.com/CoOptimus. You can also send it to our Dropbox here: https://www.dropbox.com/request/cd2gQaNYrthPyNI2IWuP - just be sure to include some contact info! Anyone who submits a video will automatically be entered into a contest to win an array of fabulous prizes, from video games, accessories and PC gaming hardware. The Grand Prize is a brand new Xbox One X! Please note, though, that any lewd, inappropriate, or otherwise objectionable material that is submitted will be tossed right out and you will not be eligible to win anything. Submissions will be open for sometime and the contest is going to run into January. Keep checking back to Co-Optimus for the latest detail and a list of prizes! 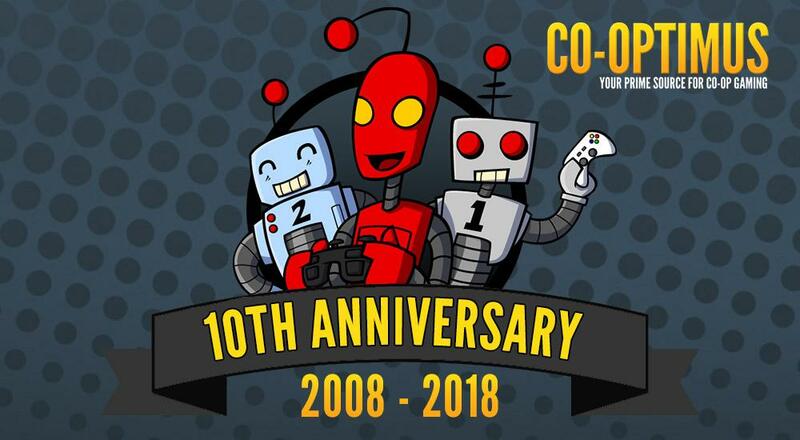 Thanks for visiting these past 10 years and making Co-Optimus your prime source for co-op gaming. Page created in 0.5653 seconds.